On Tuesday, November 22nd at 7:00 PM, the Washington Square West Civic Association will be discussing the Mayor Jim Kenney's proposal to convert the Spruce and Pine buffered bike lanes into protected bike lanes. We're asking supporters of safe and livable streets to attend this meeting and speak up for these critical safety improvements. The protected bike lane plan is already funded, but it's getting some misguided pushback from those who want to continue using the bike lanes for double-parking, so we need supporters to come speak up. The meeting is at 233 S 10th St, Rm 105. 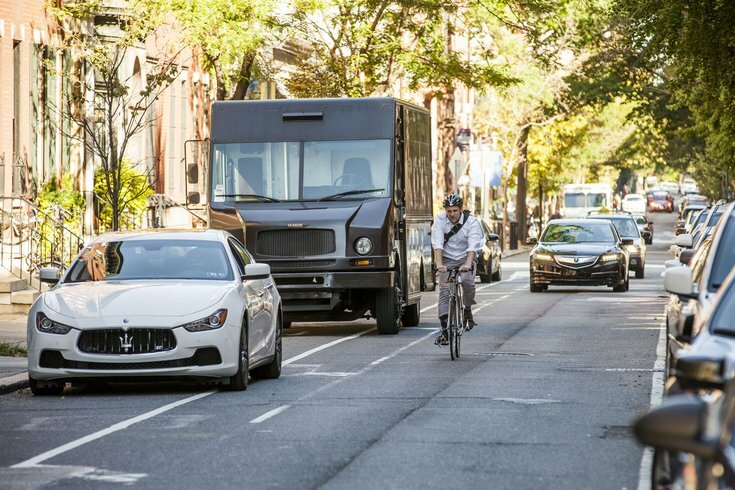 As anyone who's ever biked on Spruce and Pine knows, these bike lanes are constantly being blocked by delivery trucks and idling vehicles, forcing cyclists to put themselves and others in danger by swerving into traffic. With Amazon and other delivery services delivering more and more packages, there is a clear need to create more loading spaces, but the bike lanes are not the place for that—the vehicle parking lanes are. RSVP today to come out and show your support for Mayor Kenney's plan.